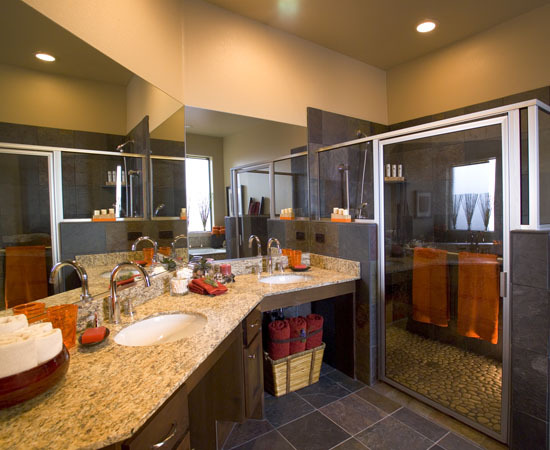 Rugged mountains cradle Red Mountain Spa in Ivins, Utah, and the guests feel coddled as well with spa treatments, fitness & health classes & fun activities. 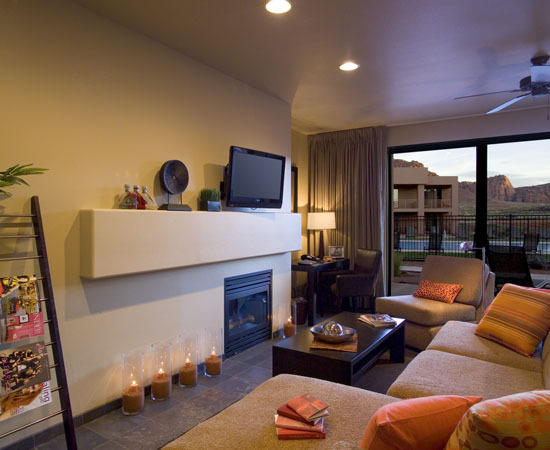 In addition to visiting Red Mountain, you can actually live there in their cozy canyon enclave called the Residences at Red Mountain. The earthy color scheme of the villa decor reflects the desert. The living room is a soothing sand with deeper taupes, goldenrods, rusts & burnt oranges of the surrounding red rocks & mountains. SpaHome Secret: Mimicking surroundings in interiors helps reduce stress. Your body & mind don’t need to adjust or transition when the inside and outside environments are similar. My favorite feature of this living room can’t be seen. The sofa and ottomans are made of Kashwere . As soft as a bunny’s belly, Kashwere is a microfiber chenille – their robes were made famous when Oprah named them one of her Favorite Things. Red Mountain’s designers had the foresight to have the furnishings made from this fabric. You may never want to get off the sofa – um room service please? While having custom made Kashwere furniture is beyond most of our budgets, Kashwere does make throws and blankets. These can be tossed over your ottomans/chairs for instant sofa softening. Did you notice the magazine ladder? It’s a handy way to store your current reads and keep them in view. Warning: Do not overload – too many will lead the clutter and steal the spa right out of this organizing tool. The best choice: Go for a bamboo ladder at least 72″ inches high to bamboozle that reading pile with style. Like the one from Gaiam. A too small or fragile looking ladder will add to visual busyness rather than “sorting it out”. Red Mountain also employs these ladders in bathrooms as towel racks. A slate floor & shower walls keep with the natural decor – while adding depth and signaling slowdown time with a new element. SpaHome Secret: Instead of matching towels to bath decor especially when the bath is all neutrals – bring in color from another room in the home with them. Normally I’m not a shower girl, but I’m a sucker for pebble floor showers like Red Mountain’s. 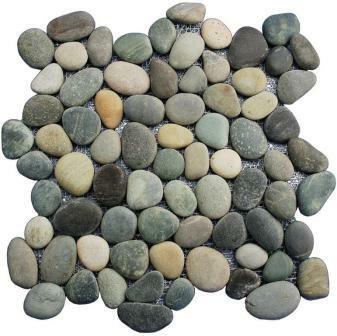 Walking on pebbles massages the feet, improves circulation and increases energy. It’s something that can be achieved in any shower with the pebbled tiles available from places like Pebble Tile Mosaics. 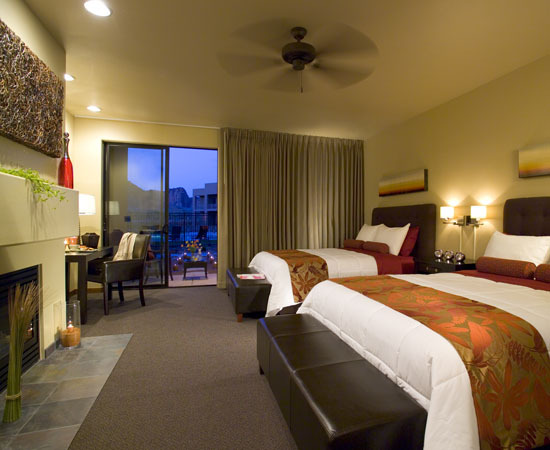 Double queen beds take up a lot of space, but the oblong arrangement of the guest bedroom looks inviting. The fireplace does it’s share of balancing out the beds, but another tip is to keep the bedding simple so it doesn’t overpower the room. SpaHome Secret: notice the artwork, the bench and even the arrangement of the bedding echo the rectangular landscape of the space – this keeps the calmness & chi flowing. Because many of us tend to overdo bedding (more is better right?) the way the linens are configured here is genius. Reddish brown sheets, a white down comforter, 4 bed pillows (2 red and 2 white) and 2 bolsters to match the sheet. Bulk is minimized by making the centerpiece of each bed a lightweight wool blanket throw. 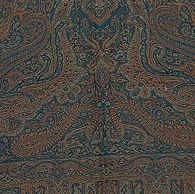 The ones from Shalincraft – e enlarged versions of a Jamawar Jacquard Shawl that the women wear there in India, come in bold colors. Just fold into a rectangle at the end of the bed. For a less expensive idea, use a wide table runner – they come in loads of colors & designs. Don’t forget a bench or trunk at the end of the bed helps define that space & can help defray the stuff factor by providing storage like this one from Target. ← Massage: Knead It or Knock It? The Lowdown on the Rubdown! The idea of having 3 benches across the bottom of the bed is particularly interesting. Yes storage space is at a premium these days. 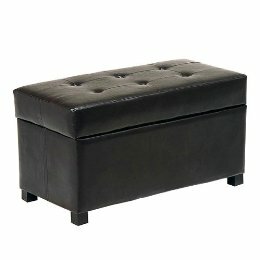 Another option you could consider is having Storage Ottomans. Storage Ottomans are very versatile. You can use them as comfortable seats, coffee tables, footstools and for stowing away the clutter, whether it is spare bedding, children’s toys, sports equipment or magazines. They also have a Bespoke Service, so you can have your Storage Ottomans designed and hand crafted especially to suit your home, whatever your colour or size preferences.